Crudely recorded yet often lively set of material from this Armenian ensemble. A mixture of late 70's prog fusion and Middle Eastern sounds is the general recipe, but the highpoints are when they get this Balkan/Zuehl/Disco thing going (if you can imagine that.) Case in point is "Dzamone (pt 2)", where muffled “earth bass” wiggles under a driving bass-beat/hi-hat, whilst an Old World canzonet rejoices the top layer, replete with sheer violin strokes, all of which succumb to a warm and fuzzy guitar meltdown at the climax. Bless the mighty Mutant for the wonderful Zartong! Fabulous. Anybody who digs this should run, not walk, to buy the discs available by current Armenian folk-rockers Bambir. What they do is more mainstream than this (think Jethro Tull with Eastern blood) but equally as captivating. hello again. well i gave this album a good listen, and it is wonderful! thanks for this super fresh album. 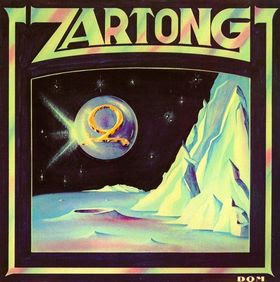 you can't go wrong with a name like Zartong! As ever, extraordinary stuff that you have made available! 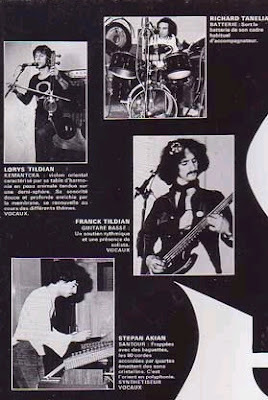 Armenian prog-fusion: I'm there! This was f*cking fantastic, thanks for sharing - must buy their cd!!!!!!!!! Fabulous band. The bass player is amazing.